Unusually for me I didn't get around to reading the Gazette of 23 April 2014 till over a week later. 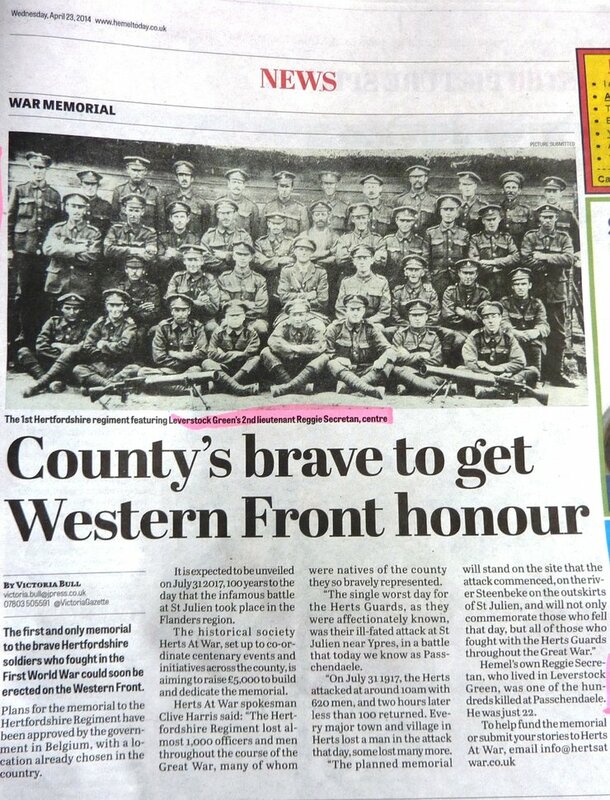 I was particularly interested to see the article on the memorial to the Herts. Regiment, with Reginald Secretan seated in the middle. 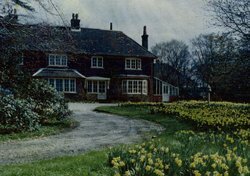 The Secretan family had moved to the Bennetts End area of Leverstock Green in 1912. (Ben. End then was the area around Tile Kiln Lane, and not the large area developed as part of the New Town.) The settled in a house called The Dells, off Tile Kiln Lane. 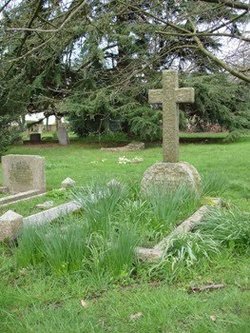 There were four children Humphrey, Reginald, Marjorie and Esme. Reggie was the youngest of the family and according to Reginald & Charles Fair in their book "Marjorie's War", he was " an outgoing friendly lad who enjoyed life and though the youngest and very much 'the apple of his mother's eye' was by no means spoiled." Still at school at Oundle when they moved to Leverstock Green, Reggie was also keen on motorbikes, and at the start of the war the M.A.T.S.C. where he drove a motorbike. 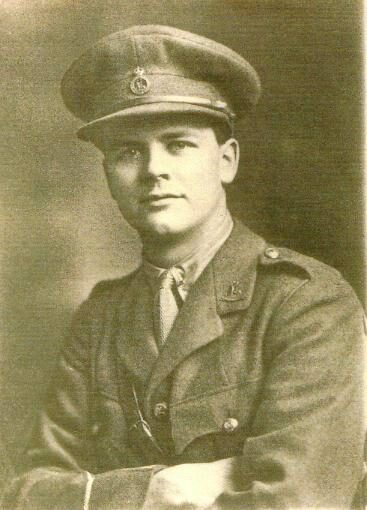 Reggie’s elder brother also fought in the first war, and was one of three officers from Leverstock Green awarded the Military Cross, and the only one of the three to survive the war. 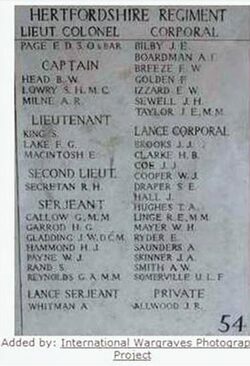 Second Lieutenant R H Secretan, the Hertfordshire Regiment, killed in action July 31st, aged 22; youngest son of Mr & Mrs Herbert Secretan of Leverstock Green near Hemel Hempstead and nephew of the late Henry Richardson of Marlborough. He was educated at Hildersham House Broadstairs, and Oundle School. On the outbreak of war, having just left school, he tried 8 times to enlist, but was rejected for short sight. Finally he was accepted for the M.T.A.S.C. and went to the front in December 1914. After serving 18 months in France as Motor Driver and dispatch rider, he came home in August 1916 to take up a commission. 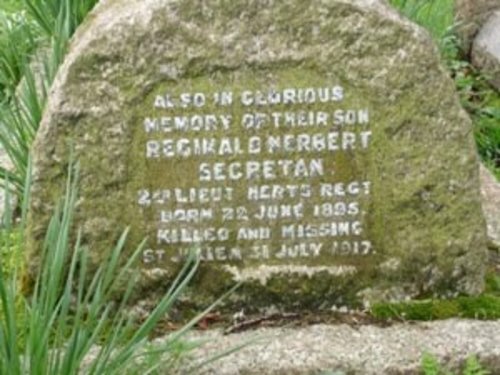 He joined his regiment at the front in January 1917. The Commanding Officer writes: n He was killed instantaneously while leading his platoon against our final objective. His men tell me that nothing could have been more gallant than the way in which he led them. He was always so cheerful and ready to do everything that he was a great favourite with everyone. There was no braver boy in the whole army. Below are a few relevant photographs including one of Reggie in uniform; pictures of the Secretan Grave at Holy Trinity Leverstock Green with a close-up of the inscription for Reggie I also recommend the book "Marjorie’s War" by Reginald and Charles Fair which charts the life of Reggie’s sister Marjorie during the war via the medium of letters and diaries and includes letters from Humphrey to his sister and mother following Reggie’s death.